Three men are lucky to be alive after the barge that they were operating caught fire and exploded early Wednesday evening. 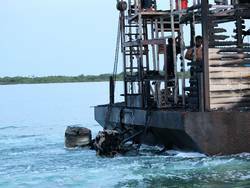 The San Pedro Sun has confirmed that the barge caught fire on the northwestern part of Ambergris Caye. The incident occurred sometime between 4:30 PM and 4:45 PM while transporting equipment and materials to construction site. The vessel, named Benita with serial number BZ-2294, is owned by Benny's and operated by Caribbean Queen, a shipping company in San Pedro. There were three people onboard at the time of the incident. In speaking to Alex Eiley from the Caribbean Queen, he explained that the captain of the vessel was his son Dennis Eiley. Just before the explosion, all three passengers managed to escape by jumping through the front glass window of the barge. Eiley said that he is thankful to God that his son and the two other passengers managed to escape off the barge unhurt just before it exploded. Eiley explained that the fire apparently started in the cabin section of the barge and quickly ran into the gas tank located on the bottom compartment. The cabin and the two outboard engines on the barge were damaged beyond repair. As for the mechanical equipment that were on the barge at the time of the incident, none received damages.